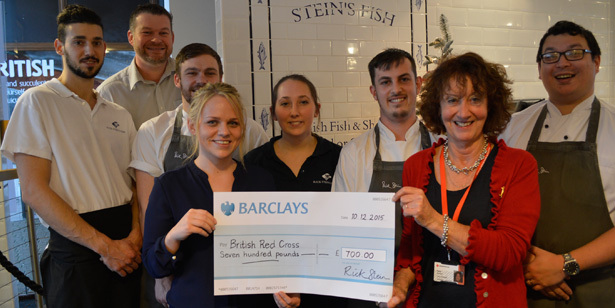 We are delighted to let you know that our restaurant in Falmouth has raised £700 for the British Red Cross. Inspired by Rick’s adventures around the world, guests enjoyed two course charity lunches in October at Rick Stein’s Fish including some of our favourite dishes such as plaice alla Carlina, cod curry and mussel masala. Each week the lunches followed a different cuisine from Rick’s TV travels around the world including From Venice to Istanbul, Spain, India and French Odyssey. The money raised will support the British Red Cross who are a global voluntary network that responds to natural disasters, conflicts and individual emergencies. They help vulnerable people abroad and in the UK to prepare for, withstand and recover from emergencies in their community. If you want to support our next charity lunches, make a reservation at The Seafood Restaurant in Padstow between Tuesday 12th January to Friday 12th February 2016 raising money for Children’s Hospice South West. Find out more here.